Abstract: The embryology of cetaceans documents features that elucidate the interaction between form and function in modern species, as well as their evolution from extinct ones. Prenatal specimens of the dolphin Stenella attenuata demonstrate critical aspects of the embryonic and fetal development of cetaceans, the pharyngeal arches, ear ossicles, nasal opening, teeth, forelimb, hind limb, and flukes. In addition, specimens of the bowhead whale (Balaena mysticetus) illustrate the development of baleen and hair. 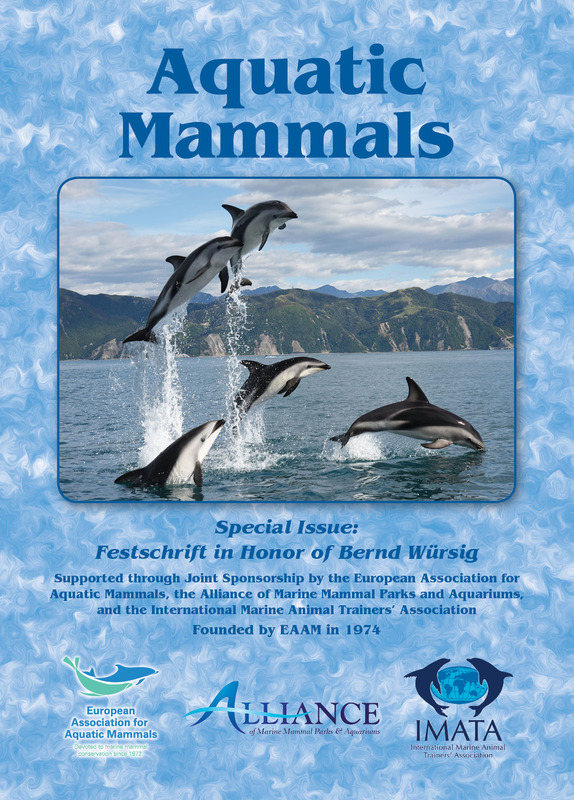 Abstract: The challenges of monitoring fully aquatic and long-living mammals have limited research on cetaceans that spans several decades to only a few populations. We report the first long-term assessment of association and residency patterns of dusky dolphins (Lagenorhynchus obscurus) off Kaikoura, New Zealand. Dorsal fin images, spanning 30 years of data collection, were used for photo-identification and social structure analyses. A total of 4,022 uniquely marked individuals were identified. Most (80%) were sighted only one time. The population of dusky dolphins off Kaikoura appears to be open, with the possibility of immigration and emigration. Dusky dolphins showed preferences for assembly into either large or small groups, which appear to drive association patterns. They did not demonstrate significant preferred or avoided associations with each other, and had overall weak association patterns. Individuals reside in the Kaikoura area for approximately eight years, and also have temporally stable associations lasting approximately eight years. Dusky dolphins fit the model of a fission-fusion society, and their association patterns may reflect unique local ecological conditions and foraging opportunities. Abstract: Home range sizes have been determined for few odontocete populations, although the understanding of comparative trends in range utilization is important for conservation. Most of the published knowledge of the Hector’s dolphins (Cephalorhynchus hectori) of New Zealand, originates from one well-studied population around Banks Peninsula. Its ranging behavior has been described previously by a decades-long photo-identification (ID) study and by a shorter radio-telemetry study. Little is known, however, about how the dolphins utilize their home range in other coastal areas around the South Island of New Zealand. We used an intensive three-year photo-ID study to define the movement patterns of Hector’s dolphins over diel and seasonal scales. Significant differences in the average movement behavior between the East Coast populations off Kaikoura and Moeraki and the West Coast populations off Westport-Greymouth and in Jackson Bay are identified. Movement patterns optimizing range utilization in relation to prey abundance and accessibility are discussed. At the Kaikoura study area, the mean distances between consecutive sightings and speeds of dolphins were considerably reduced compared to other coastal areas. Therefore, the photo-ID study was extended off Kaikoura to cover a total of 14 years. Those findings can be explained by the existence of an environmental barrier (i.e., the deep-water Kaikoura Canyon) that almost completely interrupts Hector’s dolphin movements over the short distance of 15 km and very likely has led to a reduced genetic exchange. In conjunction with two recent studies, we present evidence of the impact of an environmental barrier on the population structure and foraging behavior of this shallow-water dolphin. Written by David W. Weller, Amanda L. Bradford, Aimée R. Lang, Alexander M. Burdin, and Robert L. Brownell, Jr.
Abstract: Risso’s dolphin (Risso’s; Grampus griseus) behavior is little described given their typical offshore distribution where research access is inherently challenging. We conducted focal group behavior follows of 51 Risso’s groups from a circling, small, fixed-wing Partenavia aircraft in the Southern California Bight from 2008 through 2012 (15 aerial surveys; 72,647 km; 86 d). Instantaneous scan sampling of group heading and behavior state (rest/slow travel, medium-fast [mf] travel, and mill), and maximum nearest neighbor distance (MNND) estimated in adult body lengths (BLs) were noted once per 30 s. Focal follows occurred for 5 to 59 min (n = 51, mean 21.6, standard deviation [SD] = 12.9). Mean group size was 25.8 (n = 51, SD ± 23.62, range 3 to 120). A total of 1,446 usable headings, 1,275 MNND, and 1,359 behavior state data points were used to calculate response variables of reorientation, splitting-joining, and behavior state transition rates relative to explanatory variables using standard multiple-linear-regression, logistic regression, or multinomial logistic regression models. Reorientation rates tended to be higher when other species were present. No explanatory variables were found to influence the splitting-joining rate. Risso’s behavior state was significantly affected by calf presence and time of day. Risso’s groups spent most (60%) time engaged in rest/slow travel followed by mf travel (33%) and milling (7%), and rarely changed behavior state. Transitions from one behavior state to another were more common in groups with calf presence, which were 4.3 times more likely to continue mf travel than non-calf groups. During early afternoon, Risso’s were six times more likely to continue mf travel versus early morning and late afternoon. Preponderance of daytime rest/slow travel likely reflects presumed need for diurnal rest prior to apparent nocturnal foraging, a pattern associated with other nocturnal foraging dolphin species. Observations from aircraft facilitate a unique bird’s eye view on social interactions and spacing of individuals, which are less available from the low-vantage perspective of other platforms. Abstract: Over four decades ago, a short paper demonstrated how photographs of free-swimming dolphins could be used to reveal scientific information about cetaceans. That paper, and a few others published during the same time period, illustrated a research technique that has become foundational in the field of marine mammalogy and resulted in a cascade of science. Photographs can be used to identify individuals, providing insights into movements, migrations, site fidelity, school structure and stability, and abundance. Photographs can be used to estimate group size and improve the precision of abundance estimates. Photographs can characterize reproductive output at the population level. Photographs allow for quantification of morphology, yielding insights into classification at a variety of taxonomic levels; and they provide a means to assess the condition and health of individual animals. And photographs can provide insights into behavior. The information photographs convey and their applications to cetacean research are ever-increasing. Ultimately, photographs have provided a high-quality and relatively inexpensive means to increase the knowledge base for most cetacean species in all of the oceans of the world through research conducted by scientists of developed and developing nations, and through citizen science conducted by non-scientists. Abstract: In the early 1970s, Roger Payne and colleagues developed a non-invasive, shore-based method for collecting data on free-ranging marine mammals in their natural environments. By using a theodolite, or surveyor’s transit, they were able to collect data on nearshore marine mammal movement patterns, habitat use, and behavior without any disruption to the animals. As technology advanced, theodolite data collection progressed from analog machines requiring manual data entry to digital equipment linked to computer software that facilitated data management and automated calculations of marine mammal positional information. There are limitations associated with theodolite use, and concurrent data collection methods can contribute information that may not be possible with shore-based research alone. Since the first published research in 1978 using a theodolite to describe the behavioral ecology of dolphins off Argentina, at least 46 species of marine mammals in 36 countries have been tracked by theodolite, and the method continues to be used globally to contribute to non-invasive marine mammal research, conservation, and management. Abstract: Estuaries are biologically productive systems that support many cetacean populations and serve as important nursery grounds for their prey but face continued habitat degradation from increasing coastal development. Because estuaries are highly dynamic systems with fine-scale environmental gradients and microhabitats, it is challenging to identify foraging hotspots. To investigate whether bottlenose dolphin (Tursiops truncatus) foraging hotspots occur at fine spatial (500 m) and temporal (time of day and season) scales in a large estuary in the northern Gulf of Mexico, we conducted boat surveys from January to December 2001 in five subareas of Galveston Bay, totaling 3,815 km. Using geospatial techniques, we analyzed the number of dolphins, group behavior, and environmental variables (e.g., water temperature, salinity, turbidity, number of boats and seabirds, and distance to the Gulf) on a 500-m resolution grid. We observed 1,802 dolphins in 262 groups, 57% of which were foraging. Two subareas, Bolivar Roads and the Galveston Ship Channel, comprising only one-fifth of the total surveyed area, accounted for 91% of foraging groups. We identified six foraging hotspots in these two areas that were used throughout the day and in every season. Hotspots were located in deeper channels where dolphins often foraged with bottom trawl shrimp vessels, near ferry landings, and along the jetties where prey are likely exposed or aggregated by currents and tidal fronts. In addition, a greater number of seabirds and vessels were recorded in hotspots relative to where dolphins were not observed. We suggest that this fine spatio-temporal scale approach is a valuable tool for the conservation of vulnerable estuarine cetacean populations, particularly if paired with population and site-fidelity studies. Specifically, determining prime foraging habitat and identifying baseline hotspot density (number of foraging dolphins per unit area) provides useful metrics for detecting changes in habitat usage resulting from habitat degradation or restoration efforts. Abstract: Within the past several decades, Indo-Pacific humpback dolphins (Sousa chinensis) in Hong Kong have gone from being virtually unknown to being probably the best-studied dolphin population in Southeast Asia. Essentially nothing was known of their status prior to 1993, but they are now understood to be part of a large population (> 2,000 individuals) that inhabits the Pearl River Estuary of southern China. Approximately 130 to 200 dolphins occurred within Hong Kong’s boundary in the late 1990s and early 2000s, but the numbers have declined since then, with currently only about 65 to 70 dolphins found within the region at any one time. Despite an ambitious management scheme by the Hong Kong Agriculture, Fisheries, and Conservation Department, mostly involving Hong Kong’s Environmental Impact Assessment (EIA) legislation, the dolphins appear to be at risk locally. A series of recommendations are hereby made to encourage improved management of these animals and include (1) management at the population level; (2) better assessment of cumulative impacts; (3) protection of critical habitat, especially along the west coast of Lantau Island; and (4) management with “teeth.” If these suggested approaches are vigorously followed, I remain optimistic about the future of humpback dolphins in Hong Kong. Historical data show us that these animals can indeed recover from anthropogenic impacts but only if important habitat areas receive better protection than they are getting at present. Abstract: Globalization has connected people and cultures at an unprecedented rate. The effects of globalization have been far-reaching on different sectors of science and technology, and the environment, including marine mammal research and conservation. Despite the increased connectivity and knowledge transfer that has occurred in the past decade, there is still an ever-widening gulf between data-poor and data-rich nations. As a result, there is an absence of different voices and limited geospatial research coverage in marine mammal science. This skewed trend precludes the positive promotion and translation of science into policy action and impacts, as well as the sustenance of conservation initiatives that affect marine mammals globally. In this article, I argue that the practice of marine mammal research and conservation as it stands today requires a paradigm shift. I do this by first discussing patterns and antipatterns of globalization, and then by recommending strategies for the marine mammal scientific community to consider and implement to challenge and change the status quo. Abstract: There were several wonderful figurative shoulders that lent inspiring views to my life. A select few belong to, in order of appearance, my papa Gerhard Würsig, Roy Tassava of Ohio State University, Charlie Walcott of Cornell University, Roger Payne then of Rockefeller University, and Ken Norris of University of California Santa Cruz. The shoulder that has been ever-present these past 50 years is that of my wife, Melany Carballeira Würsig. I thank them all. For you readers who may be in your approaching twilight years, I suspect you have similar mentors on whose shoulders you have relied for your own successes. If you are yet young (you lucky devils! ), you will appreciate those shoulders ever more as time progresses all too rapidly. Let us now hope that the persons we have relied on will engender ever more shoulders to be relied on, of each gender, race, background, and belief relative to what culture, science, education, and philosophies of humanity may have to offer.